As work to improve the A11 Fiveways to Thetford continues, road users are advised that there will be road closures on the A11 in Suffolk next week. The A11 overnight closure, which will take place on Thursday 12 June and Friday 13 June between Fiveways roundabout and the B1106 Elvedon crossroads, will allow the Highways Agency to continue work on the recently installed Gibson’s accommodation bridge. During the work, the A11 will be closed in both directions from 10pm to 6am the following morning on both days. The work is expected to complete by 6am on Saturday 14 June. We have to close a short section of the A11, when traffic flows are at their lowest, to allow road workers to safely continue work at Gibson’s accommodation bridge. We have worked closely with local partners to ensure disruption to road users during the closure is kept to a minimum. There will be a clearly signed diversion via the A1065 and B1107 during the closures, with advance warning signs placed along local roads. Road users are advised to plan ahead and allow extra time for their journeys prior to setting out. 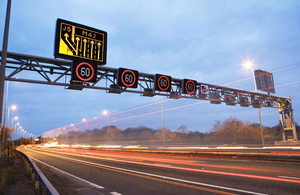 For more information about the scheme and to register for regular updates, visit the Highways Agency’s website. Road users can also call the Highways Agency Information Line on 0300 123 5000 or follow @HAtraffic_east on Twitter for the latest travel information.